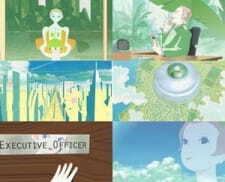 A 3 minutes long animated film produced by Studio Kajino, a small studio related to Studio Ghibli, was shown in a double feature prior to the Cutie Honey Live-Action movie. Supervision was done by Yoshiyuki Momose, director of the Ghiblies. To be released 16th November 2004 on the "Ghibli ga Ippai Special Short Short" DVD, together with other Ghibli-Shorts like Sorairo no Tane, On Your Mark, Space Station No.9, Nandaro and Various Commercials.